A murdered U.S. Navy enlisted teen who was murdered will be buried in a Batman outfit, according to reports. The Navy joined Bronx, New York teenager was killed when he tried to play peacemaker between two girls will be buried in his favorite costume, a Batman suit. Victor Maldonado was obsessed with the comic book superhero, his mother said Wednesday. "He had Batman everything," Luz DeJesus said. "He had pillows, blankets, T-shirts. That's what I'm burying my son in." DeJesus spoke as she left for the arraignment of 34-year-old DeShawn Coleman, an ex-con with a lengthy rap sheet, who is charged with the murder. "I do not want anyone killed," the grieving mother said. "I know my son is gone. But if Coleman is alive and he is awake, I hope he gets the punishment." Police have also questioned Coleman’s sister, one of the two girls who were fighting when 19-year-old Maldonado tried to calm the fight. "She said, 'Oh, I do not know how to deal with my own affairs, I'm going to find my brother,'" DeJesus said. "My son did not think anything of it. A man came and shot my son." Coleman's sister has not been identified and has not been charged with a crime. 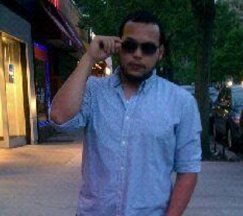 Maldonado, who was 19 and prepared to take his physical next week to enlist in the Navy, was shot dead on Monday in the Kingsbridge section when he tried to negotiate a peace between the fighting girls. They were fighting because Coleman’s sister had entered a building at 2805 Heath Avenue, and failed to thank the other girl, who had been holding the door for her, the grieving mother said. "He said: ‘Do not argue about something so small. This is only a door,’" his mother said. Minutes later, Maldonado was lying mortally wounded in a street in the Bronx. He died early Tuesday, police said.